I first visited The Palace Hotel in the summer of 1981, when I was introduced to the owners, Andreas and Hansjurg (Hans) Badrutt, by Raymond Flower, the Author of a book which was the first in a series I commissioned on ‘The Best Hotels in the World’ to be published under the ‘Debrett’ imprint. There was little doubt that Badrutts’ Palace Hotel was worthy of inclusion, and, having selected it as the first book in the series, we received great support from the Badrutt brothers, who made all their archives available to the Author, who also happily conducted most of his ‘research’ as a guest of The Palace! It is 34 years since this first visit to The Palace Hotel, and I recently decided to ‘re-visit’ this great institution, and report on the changes which have occurred in the interim, but first it is important to understand the history of the hotel, and its DNA. The history of the hotel and the family Badrutt started in 1856, when Johannes Badrutt (grandfather of Andreas and Hansjurg Badrutt photographed above) and his wife Maria realised that there was potential for a good hotel in St. Moritz as the area was already attracting visitors due to the ancient spa but the only accommodation on offer was small pensions or private houses. His had visions for a great hotel which would have international repute. 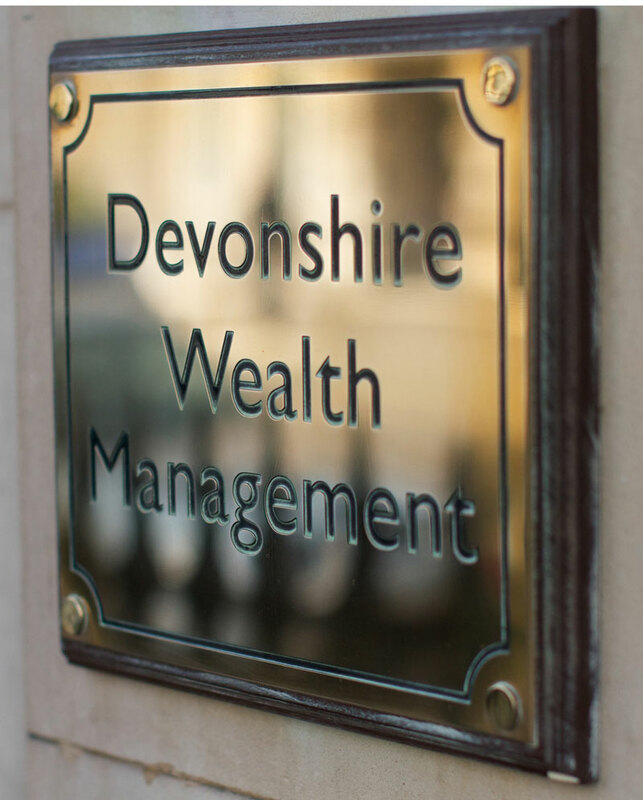 The small hotel he and his wife bought was transformed over a period of eighteen months into a 130 bedroom hotel complete with antique furniture, paintings from Italy and silverware imported from Mappin and Webb and the ultimate luxury, self-flushing lavatories. 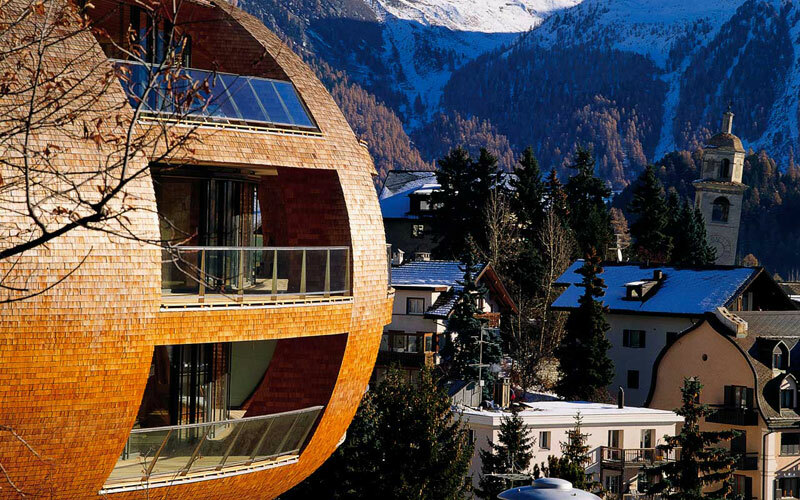 He duly renamed the hotel to reflect its transformation to, ‘Engladiner Kulm’ – the summit of the Engadine. Johannes was certainly ambitious and a visionary, the following prediction for St. Moritz could not have been more accurate when one day he exclaimed to his brother-in-law, “Look at that view, one of these days you will see huge hotels springing up in the Bad. The hotels will be crammed and the hoteliers will be like uncrowned kings. If you set up in practise here, with your knowledge of English you will make a brilliant career for yourself.” And the English certainly did embrace St.Moritz and in fact were pivotal to its future success as one of the most fashionable holiday destinations in the world. In those early days St. Moritz was only regarded as a place to visit in the Summer months, mainly for walks in the clean mountain air and to take the waters at the ancient spa, so there was little business for the hotels in the winter. At the end of the summer season in 1864, the Kulm Hotel was empty except for four remaining Englishmen who were due to depart the next day. That evening, after dinner, around the fire, Johannes Badrutt was explaining that the Winter in St Moritz was much more pleasant than all those rainy days in London, and that St Moritz was seldom without sun in the winter, and often warm enough to be in shirt sleeves, whereas in London you would catch pneumonia if you went out without a coat and hat. A chorus of derision greeted this statement. Summer in the Engadine was delightful, they agreed, but there was already a cold nip in the air, and you would have to be mad to spend a winter snowed-up in the Alps, with nothing to do. Johannes paused, and then said slowly: ’I would like to offer you the chance to check my statement for yourselves. This Winter you will be my guests at the Kulm Hotel; I mean my personal guests, and you will not pay anything for your stay. I bet that you will agree that what I have said is true’. Well, these English tourists could clearly not resist a bet or a bargain, and they came back to St Moritz with their families and a few friends. Expecting extreme cold they came equipped with furs and every device to protect themselves, the only thing they had not thought to pack, was sunglasses! Needless to say they not only stayed for Christmas but spent the rest of the winter there until March, returning to London, bronzed by the sun, and exhilarated by a winter of tobogganing, skating on the frozen lake and indulging in the earliest attempts at downhill skiing. Word spread and subsequent events confirm that Johannes’ bet may have been one of the shrewdest of all time, because, starting in the mid-1800s skiing became a popular recreational activity and the sport is practised around the world, and is now a multi-billion pound global industry. The Badrutt family continued to flourish in St. Moritz with Johannes’ sons continuing in the hotel business. Unfortunately Johannes’ eldest son Johann died in a carriage accident so it was his second son, Casper who was responsible for the founding of what we now regard as the most iconic hotel in St. Moritz, The Palace. It was originally called the Beau-Rivage with a distinctive tower which Casper incorporated into his new design and is used as the unmistakable emblem for The Palace. Casper’s intention was to create a palatial hotel that would outshine anything the fashionable world had yet seen. And so it was, on July 29th 1896, Princess May of Teck, partnered Caspar at the opening dance of the Ball to inaugurate the hotel. The future was set, soon the Royalty of Europe, the great and the beautiful were flocking to the Palace, attracting a train of big spenders in their wake. And so The Palace flourished through the Edwardian years, the Roaring Twenties during which St. Moritz hosted the 1928 Olympics and again in 1948, the Thirties attracting film stars such as Douglas Fairbanks and Charlie Chaplin, Harold Lloyd, Marlene Dietrich, Noel Coward, followed by the uncertainty of the War Years emerging into the fifties still with its loyal clientele and then came the sixties and its revolutionary change of social status, a new class of people – the arrival of the Jet Set. 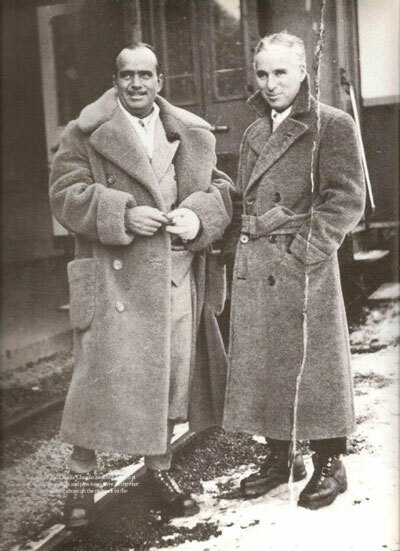 Charlie Chaplin and Douglas Fairbanks at St.Moritz station. It was not until the 1960s that downhill skiing became the winter sport of preference for the newly emerging ‘Jet Set’ who made the sport seem incredibly glamorous, by frequenting the smartest hotels in the most beautiful ski resorts. Yet none so famous as Badrutt’s Palace Hotel in the most famous ski resort in the world, St.Moritz. One couple who represented the beautiful set who frequented The Palace were Gunther Sachs and Brigitte Bardot. Gunther, born into great wealth courtesy of Adam Opel, the founder of the Opel car company, famously boasted that he had never worked a day in his life! His inheritance allowed him to fund a glamorous lifestyle and naturally he was romantically linked with several of the most beautiful and desirable women in the world but in 1966, he married French actress Brigitte Bardot in an eight-minute ceremony in Las Vegas, just weeks after they met They became one of the most glamorous and famous couples in Christendom, travelling with their entourage of glamorous disciples. Gunter never had to settle for second best and so it was at The Palace where in 1967 he took the lease for the penthouse which was of course in the iconic tower of the hotel – where else could he hold ‘court’ but in probably one of the most exclusive penthouses on the planet? At that time he was undisputedly the epicentre around which the ‘jet set’ were drawn. And he certainly stamped his style on the penthouse. As an avid art collector the apartment was filled with important art works, the kitchen alone was decorated with all ten of Warhol’s Marilyn Monroes, the entranceway was dominated by sculptures from César and Wesselmann, there was an entire wall by the New Realist, Arman and even the bathtub was by Lichtenstein! Frequent guests were his great friend Gianni Agnelli, George Harrison and Ringo Starr. One can’t help but look back at these times with nostalgia – of course they were enormously wealthy but so are the new money of today, the Russians, footballers and the like but the one difference would seem that the playboys of the 1970s had taste, nobility, discretion and wealth. 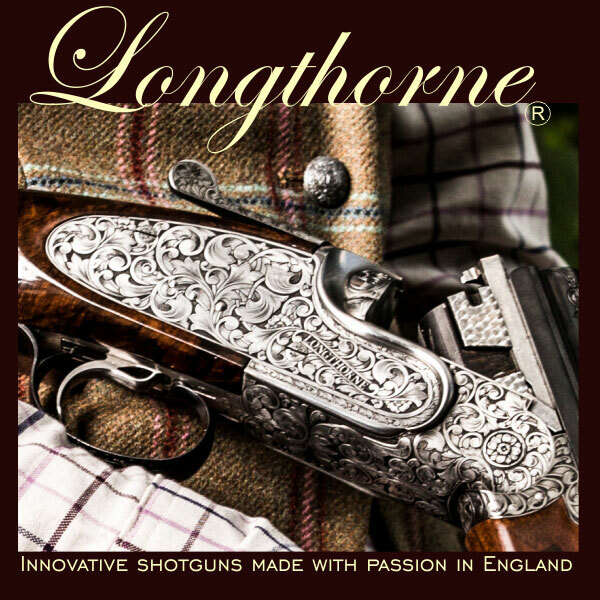 Style trumped fashion, Panache beat arrogrance. And a gentleman’s pursuits reflected it. 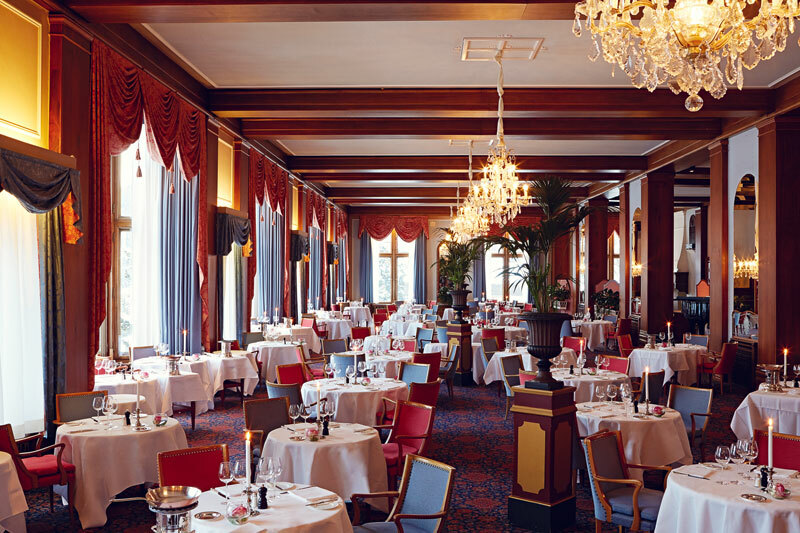 Gunter Sachs contribution to St. Moritz and Badrutt’s Palace Hotel is the stuff of legends. Sadly Gunter Sachs could not live for ever and others have taken his place. The penthoouse is presently owned by another internationally renowned Swiss publisher and businessman, the 70 year old Jurg Maquard. His passions are his estate in Zurich, motor racing, and spending time on his 60 metre superyacht, Azzura II – plus cą change! But Gunther Sachs was merely the latest in a long line of European Industrialists and Aristocrats who frequented these wonderful places, and the roll call of the regulars at The Palace Hotel reads like a combination of the ‘Almanac de Gotha’, Debrett’s and the Forbes 400 of the richest businessmen of the Western World. 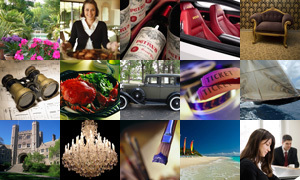 These included Count Theo Rossi of Martini & Rossi, who wrote the introduction to The Palace, A profile of St. Moritz, the Heineken Heiress, Charlene de Carvalho, the Furstenberg’s, and a handful of Greek billioniares with names like Onassis, Niarchos and Livanos, and the Fiat boss, the impossibly handsome Gianni Agnelli, Alfred Hitchcock, Audrey Hepburn, and Mel Ferrer, Henry Ford, The Duke and Duchess of Windsor and King Hussein of Jordan. As if The Palace was not exclusive enough, in 1930 these European Royals, and some very successful businessmen formed, and were the first members, of The Corviglia Club in St Moritz. Originally a simple hut for these enthusiastic skiers with a passion for ski races to rest, providing them with a rudimentary cuisine. However it was not long before this hedonistic group had arranged for The Palace Hotel to take on the catering with lunches being served by the hotel waiters and members being conveyed to the funicular station in a car painted in the Club’s silver, blue and brown colours. The custom also grew up of holding moonlight dinner dances, often with a firework display following which the hardier souls skied down to St. Moritz carrying torches. Of course membership is still strictly by invitation as are London Clubs but this allows those in high profile positions who find it difficult to escape the public eye, even when on holiday, to be assured a level of privacy in which to relax. 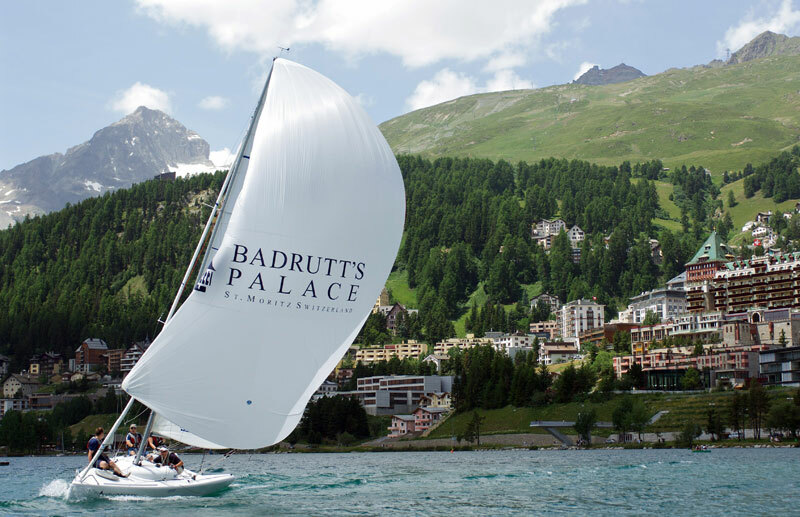 So it is without doubt that St.Moritz and Badrutt’s Palace Hotel has established its place as one of the most glamorous places to see and be seen. 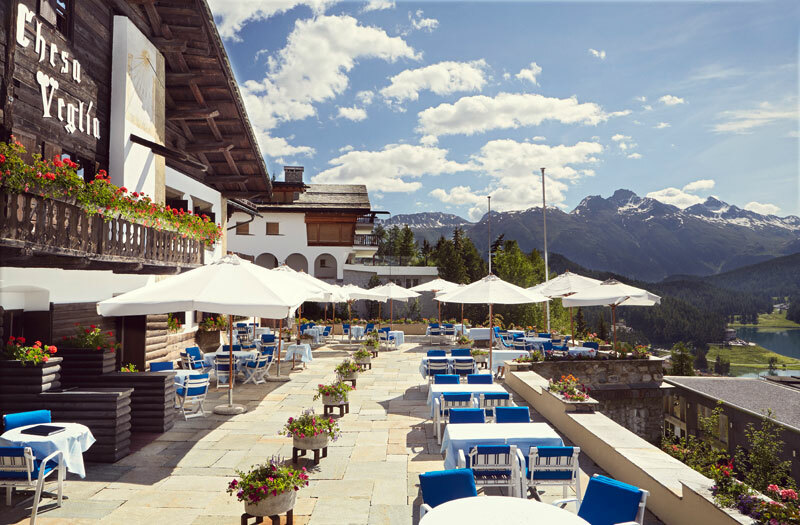 For us lesser mortals, what besides staying in Badrutt’s Palace Hotel demands a visit to St. Moritz? 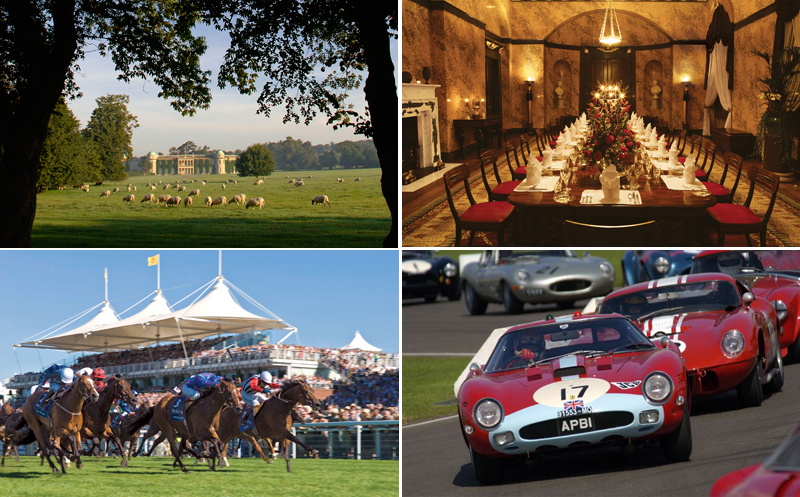 Well there is plenty to see and do in both winter and summer. I was given a tour of St. Moritz by the delightfully energetic Susi Wiprächtiger a tour guide in the summer and ski and swimming instructor in winter. Our first stop was to the ancient spa, now housed in the St.Moritz Museum, which was the original attraction for those earlier 19th century visitors who came to ‘take the waters’ long before the ‘invention’ of winter sports. The origins of the spa and the therapeutic effects of the mineral springs had been known by the ancient Engadins for some 3500 years. This is known because in 1853, construction workers discovered the original wooden reservoir made from the hollowed-out trunks of two huge larch trees which these early settlers had used to capture the precious spring waters. These larch tree trunks were later dated to have been felled in 1411 BC – to put that into perspective, is 200 years before Moses left Egypt and over 700 years before Rome was founded! Susi encouraged us to sample this ferrous, naturally carbonated water and if her energy levels are as a direct result of taking the waters daily then their medicinal properties are well and truly proven. Next was a tour of the centre of St. Moritz. It is a vibrant modern town which has skilfully retained its Swiss Alpine appearance interspersed brilliantly with modern architecture. The man mostly responsible for this is Norman Foster. Just one of his buildings and probably the most futuristic is aptly nicknamed Chesa Futura (House of the Future). It is a perfect example of how a new residential building can work in harmony with the environment by using locally sourced larch which will only improve with age as the colour gradually fades. He also designed the building to be on stilts which is a traditional method of farm building in Switzerland to avoid moisture and deter pests. 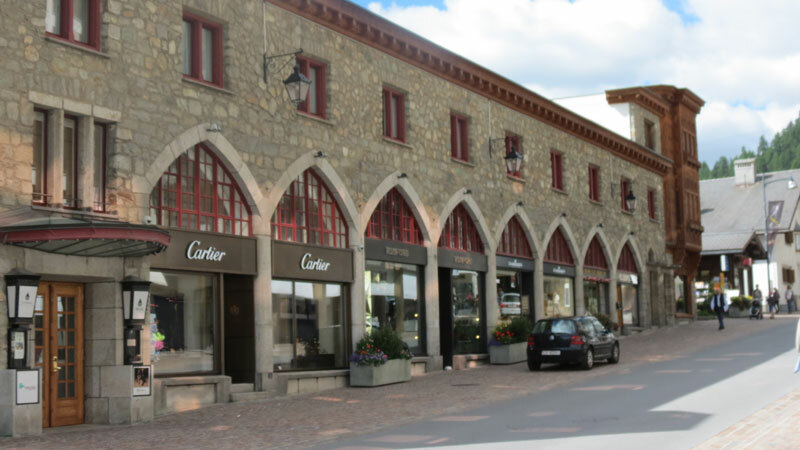 It goes without saying that the quality of fashion shops in St. Moritz is second to none, with every famous fashion designer represented but do not neglect your inner self too. Susi introduced me to some local delicacies. The Engadin Valley is famous for its cured meat provided by locally reared cattle and venison. A must visit is the shop of the Hatecke Family which is an exercise in a feast for the eyes as well as the taste buds The shop is that wonderful combination of modern streamline interior housing the centuries old craft of drying meat. 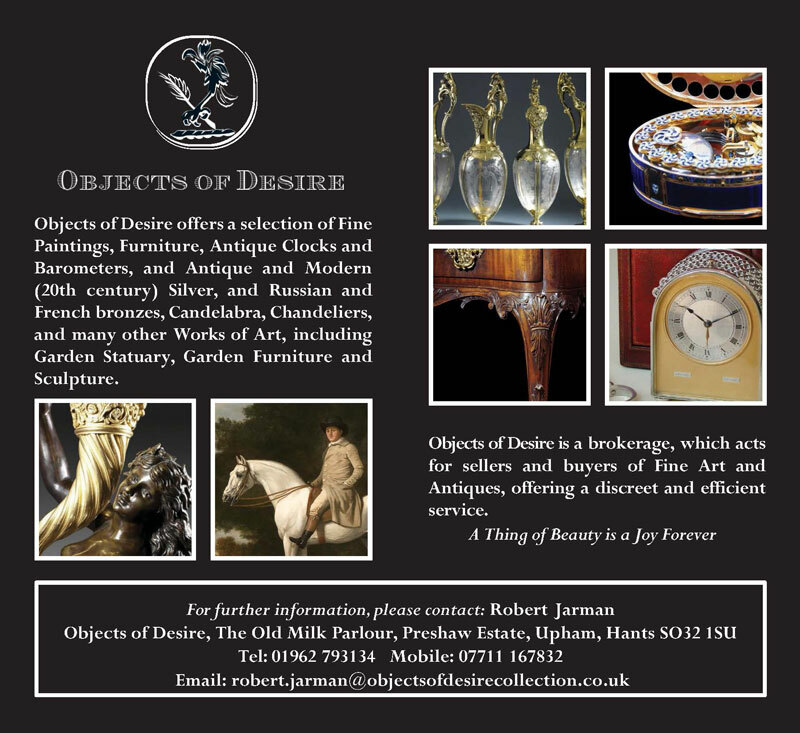 Click HERE to visit their shop. And it wouldn’t be St.Moritz without a caviar shop combined with top quality teas and coffee beans at Glattfelder’s (click HERE) and a must to sample Swiss chocolate and the local delicacy, Nusstorte. Of course one is spoiled for restaurants in St. Moritz but one that is intrinsically linked with The Palace Hotel is Chesa Veglia. It is as much part of St. Moritz as the hotel so that it is totally fitting that in 1934 Badrutt’s Palace Hotel acquired Chesa Veglia. Again it was the foresight of the Badrutt family, this time Hans Badrutt, the grandson of Johannes, who knew instinctively that this lovely Engadine Farmhouse, the oldest in the village, should be part of The Palace experience. Of course it became the ‘in place’ to experience a bit of ‘après ski’ which it continues to be but is now a very sophisticated restaurant with two bars offering everything from Italian classics at Pizzeria Heuboden to Swiss international specialities in Patrizier Stuben and in the winter only, sophisticated cuisine in the romantic, Grill Chadafo. Although it is walking distance from The Palace, in true Palace style one can be driven to the restaurant in the hotel’s Rolls Royce. 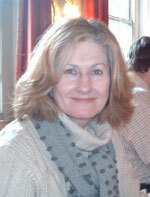 Just one of the delights of being a Palace guest – nothing is too much trouble. Although we were visiting in August it is important to mention what St. Moritz is famous for and that is tobogganing and in particular the Cresta Run. In the summer months the famous starting points, Top and Junction, look slightly unimpressive but come the snows they will transform into the challenging slopes that have excited so many thrill-seekers. Yet again it was an Englishman who was the first to attempt this crazy challenge. For some reason hurtling oneself face down on nothing more substantial than a reinforced tea tray has satisfied audacious adrenaline junkies. Speeds of 53 to 80 mph are reached whilst negotiating the ten corners (all individually named) of the three-quarter mile long icy track which drops by 514 feet and as so frequently happens riders come a cropper at the infamous Shuttlecock Corner. Their reward for this is to be presented with the Shuttlecock Tie which is then worn with great pride. Please note ladies that this is for ‘men only’ as woman have been excluded from taking part since 1929! 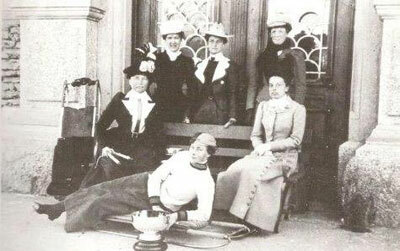 Here is a group of ‘Cresta Girls’ from 1895. What is so fantastic to remember is that in those days trousers for women had not arrived and that all these very fast and some highly dangerous sports were accomplished in skirts. The ladies would encircle the skirt with a circle of wide elastic round the thighs just above the knee which prevented the skirt from flapping about! Some daring women would wear riding breeches but this was frowned upon as being ‘fast’! Immediately adjacent to the Crest Run is the course used by the St Moritz Toboganning Club founded in 1887, three years after the creation of the Cresta Run; its principal activities are ‘the conduct of races and practice on the Cresta Run and the encouragement of tobogganing generally’ It is possible for two people to take a ‘Toboggan Taxi’, with the front man controlling the speed whilst his partner controls the direction, and it is possible for these professional Tobogganers to do the descent in less than one minute (60 seconds) so this is not for the feint-hearted! Gunter Sachs was president of the Bobsleigh Club for more that 40 years and it is generally acknowledged that without his support bobsleigh in St. Moritz would not be what it is. He financed the very expensive infrastructure of the sport for many years. At the end of the year when the bobsligh club checked its balance and saw a deficit, it was Gunter Sachs who paid it. 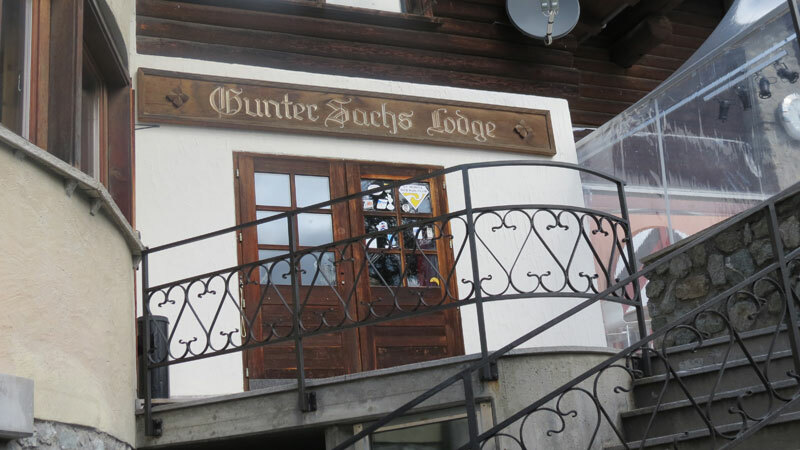 That is why at the start of the Olympia bob run, it is called the Gunter Sachs Lodge which will remain so as a fitting memorial to him and his love of downhill racing and St. Moritz in particular. 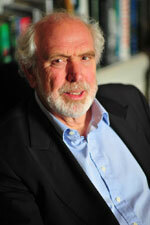 He also founded the Dracula Club in 1974 which is located in the Kulm Hotel. Why ‘Dracula’ is a bit of a mystery other than it is very much related to the enjoyment of life and no-one could say that he and his friends did not have a good time. It’s logo is a bat – a creature of the night! It is run today by his son, Rolf and is still the most popular and most exclusive club in St. Moritz. All of these activities and more take place in the winter months. The eponymous frozen lake is the setting each winter for skating, curling, golf, polo, horse racing, show jumping and even cricket. Furthermore all of these can be viewed from the Badrutt’s Palace Hotel. Ironically, we now think of St. Moritz as being synonymous with winter sports which is the complete opposite of why those early travellers visited the area but this could not be further from the truth. 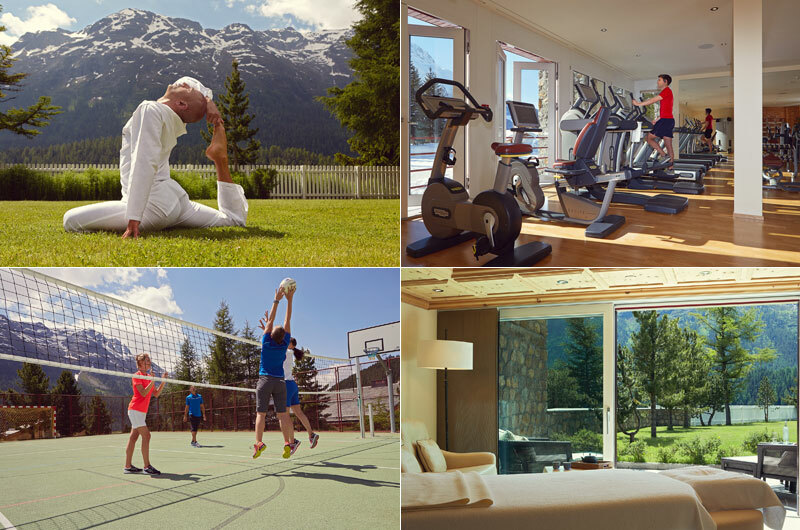 Summer in St. Moritz and in particular staying at The Palace is all about sunshine – 300 days a year on average – relaxing just taking in the spectacular mountain scenery. And when you feel the need for doing something more energetic, there are the three tennis courts, or two 18 hole golf courses and the hotel has three sailing boats. The palace Hotel itself has not rested on its past glories. The Badrutt family are well aware that times change and peoples’ expectations become more demanding. The hotel has continuously upgraded its level of service and modernisation to bring it up to the exacting standards of the 21st century whilst always maintaining and honouring the style of the 100 year history of the hotel. Priorities were somewhat different when the hotel was originally built in the late 19th century; then the original hotel had 140 bedrooms over three floors with only one communal bathroom for each floor and just three suites with private baths – after all there were chamber pots and the maid brought in the water for washing at eight in the morning! Of course the hotel’s bedrooms are superb, still with the same stunning views of the Alps and lake St.Moritz, which even the Badrutt family could not improve on, but each of the 157 rooms and 37 suites are individually designed with every comfort and modern facility for the busy executive who cannot quite leave work behind. No modern hotel would be complete without its spa and pool and The Palace does not disappoint. In 2000 they created a sensational new spa which has to rate as one of the best in the world, if only for the spectacular view. It is reached by descending in the lift from the reception area and emerging into a passageway literally hewn from the rocks on which the hotel was built. This immediately creates a feeling of calm and one is led along this underground passage to re-emerge into the light-filled pool and spa. The pool is encased under a huge glass roof, with stunning views of the lake with mountains beyond and also has an adjoining outdoor, hot water plunge pool, which is accessed by an electric sliding door which rises to allow entrance, and then descends again to keep the heat in. The Wellness Spa offers numerous treatments, and is quite the most luxurious one I have ever visited, and is a great asset for the hotel. 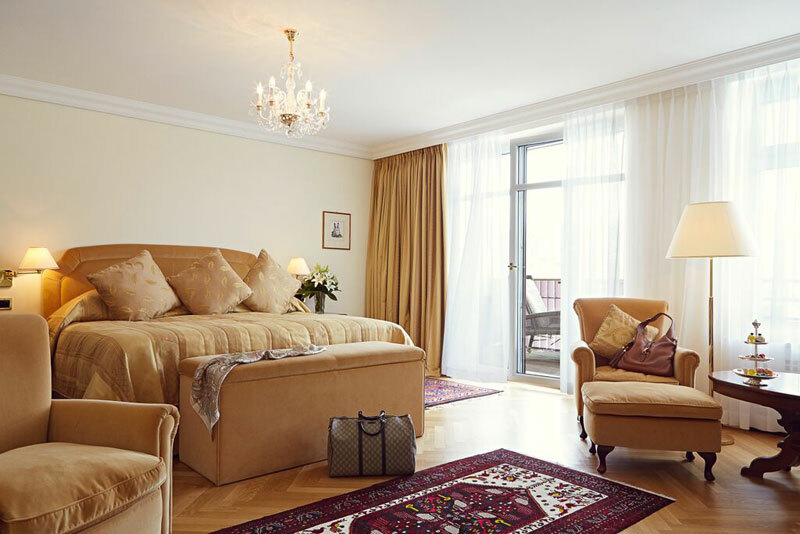 The grand public rooms of the hotel have remained traditionally furnished, adorned with art and furniture collected by four generations of the Badrutt family. The Grand Hall, focal point of the hotel, is an arcade of Gothic arches, Persian carpets, Madonna’s and sconces, brocade and silk armchairs, beneath a vast ceiling of ornately carved wood. The adjacent Madonna Room displays ”The Assumption of the Madonna,” which, according to the hotel, is believed by some art critics to be the original of Raphael’s ”Sistine Madonna” in Dresden. If this were ever proved to be the case, then this painting could be worth as much as US$50 million, or more; meanwhile it makes a great ‘conversation piece’! Last but not least are the restaurants. There are several choices depending on the time of day. We breakfasted in Le Relais and lunched on the terrace or there is the spa restaurant, La Dalia – perfect on a sunny day and there is the Japanese-Peruvian cuisine of the world famous chef Nobuyuki Matsuhisa at La Coupule, but this is only available in the winter. However, we dined in the elegant ‘Le Restaurant’. This is the ultimate of sophistication and somewhat daunting knowing that the staff are used to Royalty and about every famous or infamous person on the planet. However as we had found throughout the whole of our stay the waiters are ultimate professionals and take great pride in their work with no hint that we were any more or less important than the couple seated at the next table who were obviously regulars. We chose traditionally from the menu, electing to have Steak Diane and then Crepe Suzettes purely for the pleasure of observing the waiters performing their skills ‘à la table’. A perfect finale to a perfect stay. The Palace has become a welcoming symbol of old fashioned values of luxury and personal service in a world of the mediocre, dominated by mass tourism, and it is so refreshing to be treated with such courtesy, rather than just being another guest in a chain of hotels where all the rooms are the same, and you seldom even see a member of staff. The Palace Hotel is the exact opposite; there is a small army of beautifully trained staff, some of whose families have worked there for generations. We were treated with great civility and politeness and welcomed with open arms; almost being treated as if we were one of their many regular guests. Every member of the staff is aware that they are there to make sure your stay is as enjoyable as possible, and although we were only there for two nights, by the time we left I was being greeted, by name, by many of the staff. Finally I have to indulge myself by recounting a few memories from my first visit to the hotel. 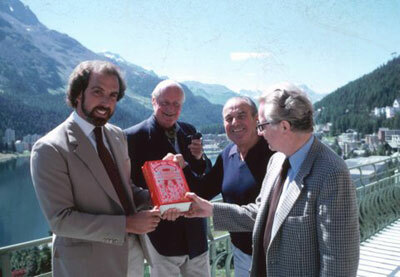 When Debrett’s book, The Palace, A Profile of St. Moritz, was published in October 1982, the launch party took place in the penthouse of the Martini Tower with panoramic views over central London, which had been kindly ‘lent’ to us for the evening. 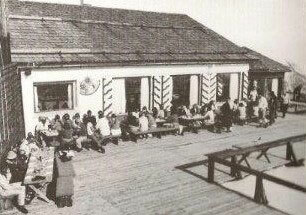 This was a great success, and attracted many of the good and the great, and it was followed, two months later by a Press Visit to St.Moritz comprised of some of the most distinguished journalists of the time, including Lady Olga Maitland, who had a weekly column in The Sunday Express, Terry Coleman of the Guardian, James-Hughes-Onslow who still writes for ‘Londoners’ Diary’ in the Evening Standard, Sir David English, the Editor of the Daily Mail, Olivia Hussey, the Editor of the Ski Club of Great Britain magazine, and Jon Connell, who was then working for BBC World Service. In order to help me look after these well-known journalists, I invited three of my co-directors of Debrett’s Peerage and Baronetage, including Sir Iain Moncreiffe of that Ilk, Bart, Philip Edwards, who is Anglo-Swiss, and was therefore able to translate as required, the Hon Anthony Abbott who was Canadian Privy Councillor, and represented a large investor in Debrett’s. Anyway, they helped me wine and dine our guests, and accompany them to the various activities we had arranged for them, which included visits to the Cresta run, and dinner at the Chesa Veglia. I had previously obtained the support of the Swiss Tourist Office, and Swissair who provided first class tickets, as did Swiss Railways, and the Palace hotel provided the accommodation. This was in some of most impressive suites, because it was the week before Christmas and the jet setters had not yet arrived, so I remember being allocated the Onassis Suite, which was, as you might expect, magnificent. Our Press visit was a great success, and we received lots of favourable comment in key, opinion forming newspapers and magazines in the UK and, via the BBC World Service, to a global audience then, of 265 million, but which recently passed 300 million. I remember that Jon Connell, who was then a junior reporter with the BBC World Service, went beyond the call of duty by recording his maiden descent on the Cresta Run, on an old-fashioned radio cassette tucked inside his jacket, his shrieks became louder and louder until there was an enormous ‘crunch’ when he came out at Shuttlecock, but he was very pleased when he became the proud recipient of the Shuttlecock tie presented to him sometime later. However, the great thing about introducing these journalists to St.Moritz and The Palace Hotel at first hand was that they could fully appreciate just how synonymous they are with the art of skiing. With its 350 km of ski runs, and the legendary ‘Cresta’ and ‘Bobsleigh’ runs, this is a winter sportsman’s paradise, and has always attracted the aristocratic thrill-seekers in droves. 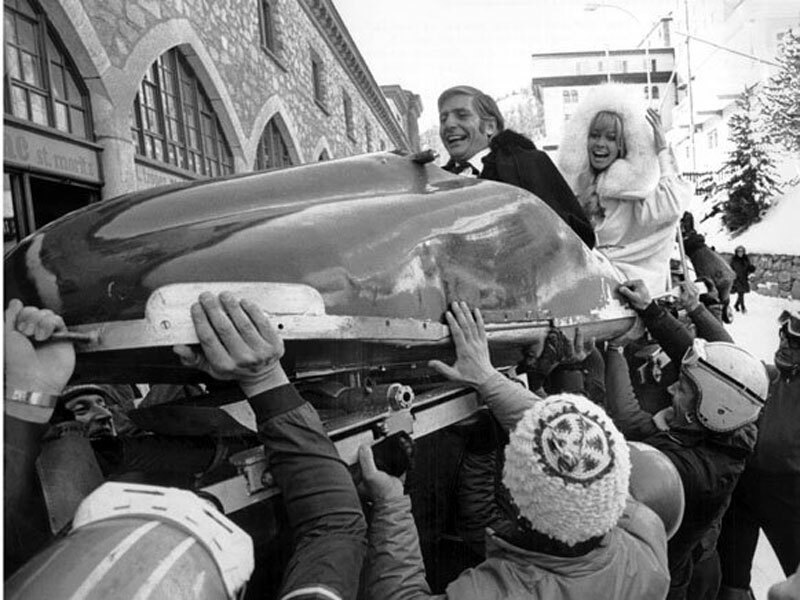 When we were there in December 1981, the St Moritz Tobogganing Club was still being run by Lieutenant-Colonel Digby Willoughby, who was one of a two-man bobsleigh team that broke the world record in 1961. He was the incomparable chief executive of the St Moritz Tobogganing Club for 24 years. Willoughby was the epitome of an almost Wodehousian English gentleman; immaculate in appearance, occasionally crusty, but generous, loyal, fearless and gallant. Despite the growth of the club, he fiercely guarded its traditions, which he saw as part of the last truly amateur sport. To his management of the club and the Cresta Run he brought style, enthusiasm and meticulous attention to detail, insisting that everyone from the newest beginner to the most senior member adhere to the rules that he devised for efficiency and safety. He was appointed MBE in 2002, and died on February 27, 2007 at St Moritz, the day before he was watchingh the Willoughby Cup, which he founded. 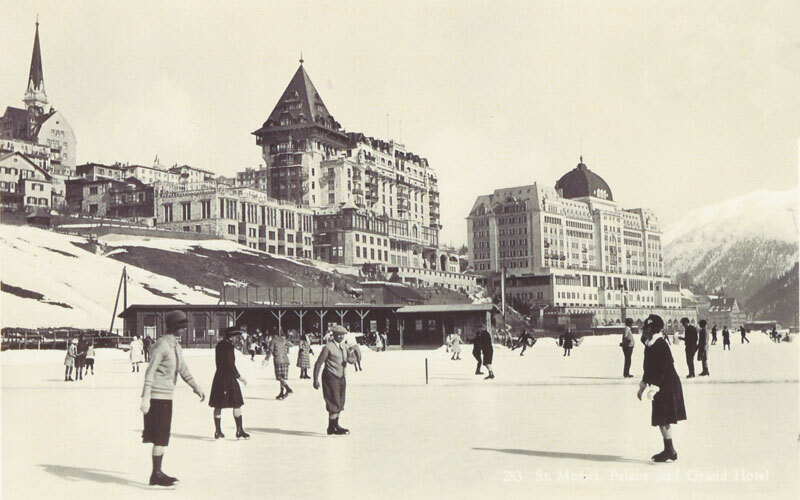 Other activities at St Moritz include Polo matches and horse racing on the frozen lake, and curling and skating on the hotel’s private rink in the winter, and Sailing, Golf and Tennis in the summer. What more could you wish for? 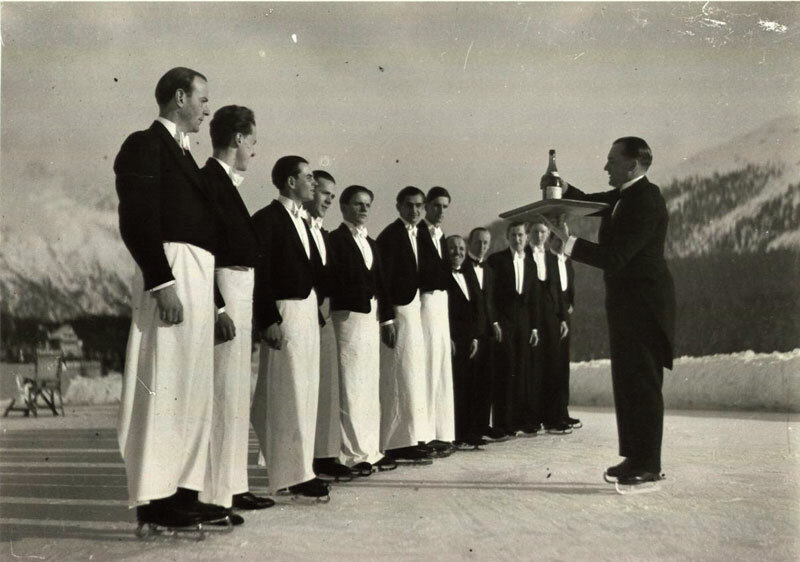 Furthermore, the waiters at The Palace Hotel were trained to serve Champagne whilst wearing ice skates, to the hotel guests on the frozen lake, such is their dedication to serving their guests in all circumstances. This is a good note on which to finish this ‘Appreciation’ of Badrutt’s Palace Hotel, but I hope it has sparked an interest in visiting this extraordinary institution, and I can assure you of a warm welcome. P.S. The Palace, A Profile of St. Moritz by Raymond Flower is now out of print but can be purchased through Amazon and the book is clearly becoming something of a ‘classic’ with pristine copies costing up to £50.00. It makes for fascinating reading about the history of St. Moritz and the Badrutt family.